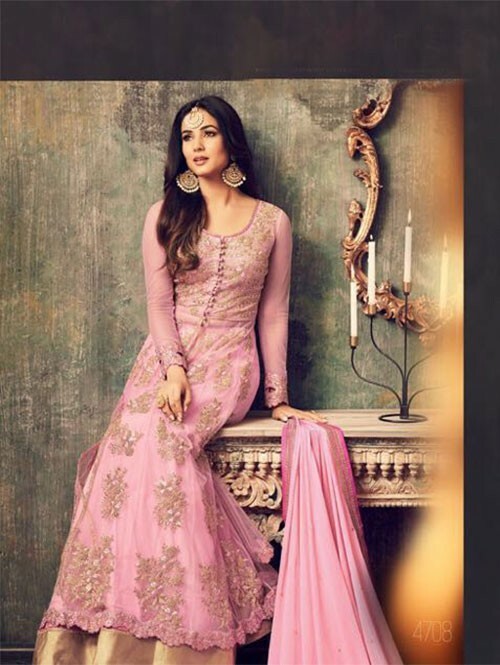 New design style and pattern could be on the peak of your beauty as soon as you attire this Pink colour floor length anarkali suit. The ethnic and heavily embroidery and its jewel neck line add a sign of attractiveness statement with your look. Made up by rich material. Blue Colored Embroidered Heavy Resham Work and Zari Worked Lehenga Suit. Beige Colored Embroidered Heavy Sequence Badla Work and Zari Worked Lehenga Suit. Peach Colored Embroidered Heavy Sequence Badla Work and Zari Worked Lehenga Suit. Red and Beige Colored Embroidered Heavy Sequence Badla Work and Zari Worked Lehenga Suit. Off White Colored Embroidered Heavy Sequence Badla Work and Zari Worked Lehenga Suit. Peach Colored Embroidered Heavy Sequence Badla Work with Cotton and Zari Worked Lehenga Suit.